I'm completely hooked on bath products, so much so that I assume everyone else is as well. Just in case they aren't though, I like to give people bath products that come in beautiful packages. I figure if they aren't ever going to soak in them, they can at least leave them out to admire. I have a friend who is getting married very soon and her bridal shower was a couple of weeks ago so I set out to tackle a project I'd had on my "To find someone to make this for" list for awhile. She's one of my favorite people in the whole world and is truly girly so I knew this would be a perfect gift for her. I looked at several websites and ultimately tweaked some recipes to come up with one that worked well for me. I encourage you to do the same. Combine the baking soda and citric acid until they're well mixed. Add in the oils until the mixture is the consistency of wet sand. Sprinkle in the water, some even suggest you put the water into a spray bottle and add it in that way (you'd have to be familiar with the consistency you're aiming for though). You'll want to stop as soon as the mixture feels like crumbly pie dough. 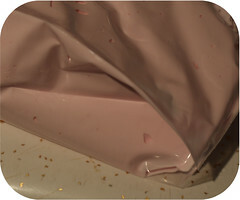 It will fizzle a little, you want it to fizz as little as possible, thus adding the liquid very slowly. 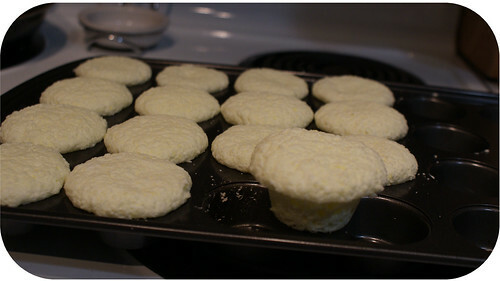 Quickly pack it into mini muffin tins or silicone cupcake liners. Pack them really tight but do know they might rise a bit as they set. After about 10 minutes, attempt to remove one of them. If it seems a bit too moist still, put the tray in the oven on the lowest setting (my oven is 180 degrees I think). Let them sit in there for 10-20 minutes, it won't hurt them. Now it's time to frost these puppies!! Mix the egg whites and water in a glass bowl until it is dissolved. Add in the sugar and cream of tartar. Mix on high for 7-10 minutes until stiff peaks form. If the mixture is too stiff at the start, add in a little water but be careful! Once those peaks form, add in the fragrance and color. Spoon the mixture into a frosting bag with a tip or a zipper bag with the corner cut off (that's what I did) and frost however you'd like. I did a simple swirl pattern. 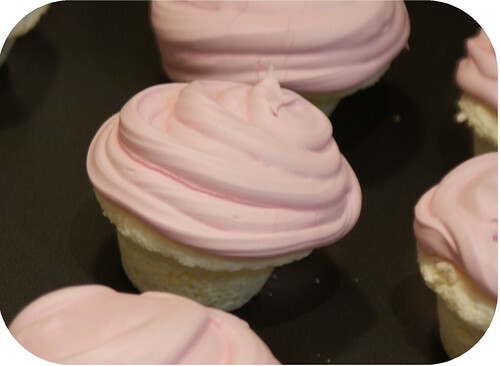 Be very careful not to load the "frosting" too close to the edges as it might droop over (some of these are NOT good examples, I learned this lesson the hard way). 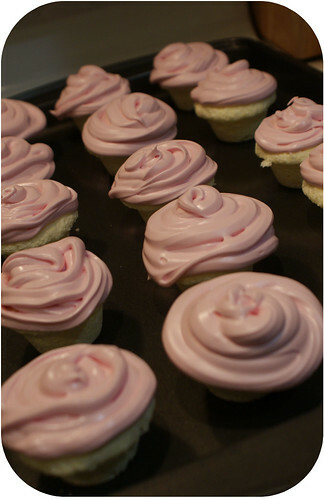 If your frosting seems like it is going to stay where you put it, you can just let them sit overnight to dry out. If not, or if you're short on time, pop them back in the oven on around 180-200 for 30-60 minutes. 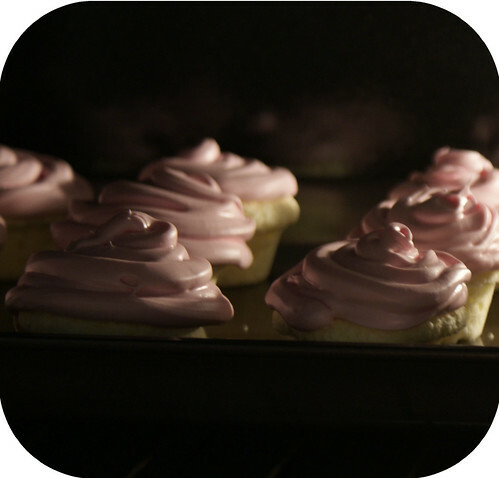 When you touch one and the frosting feels dry, they're ready to be cooled then packaged up! I used my Silhouette cutter to make some pretty little boxes using the Cupcake Box by Samantha Walker. Sadly, I was running out the door to the shower and never took a picture of my pretty little bath cupcakes in their holders but I'm sure you can use your imagination. I entered this craft in a contest on Facebook. The most "likes" wins a gift card from Factory Direct Craft. If you're not already a fan of theirs, go check them out, their posts are thoughtful and they have some really fun craft ideas (like this one). 2) Like my contest entry. love these!! Got to try it! Perfect Thank You gifts for my guests when I celebate my 50th bday next month! SOooo cute! This is DEFINITELY going on my "To-Attempt" list on my blog.